Huelga General Yo Voy! 29 Marzo 2012 CCOO -- Quieren Acabar Con Todo Los Derechos Laborales Y Sociales -- Con Todo. General Strike March 29th 2012 CCOO - They Want To Put An End To Labor And Social Rights. And To Everything. 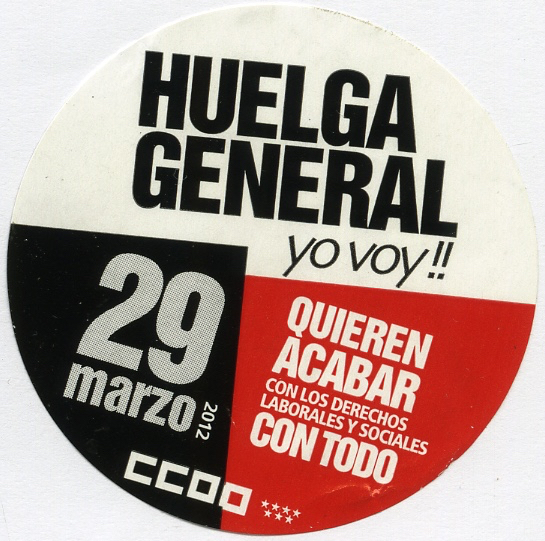 This is a sticker advertising a general strike on March 29th 2012. On the bottom of the sticker you see the letters CCOO, which stand for Confederación Sindical de Comisiones Obreras (Worker's Commission). This is the largest trade union in Spain. The strike was organized between CCOO and UGT, another Spanish trade union. People took to the streets to speak out against the labor reform and austerity cuts implemented by the government of Prime Minister Mariano Rajoy. The strike fell on his 100th day in power during the midst of Spain's economic crisis.